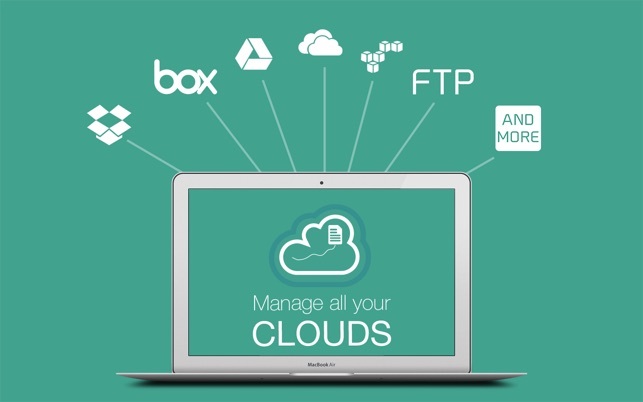 AirFile lets you manage multiple Dropbox, Box, GoogleDrive, OneDrive, OneDrive for Business, Bitcasa, Copy, OwnCloud, FTP, SFTP, WebDAV, Amazon S3, DreamObjects in one place. 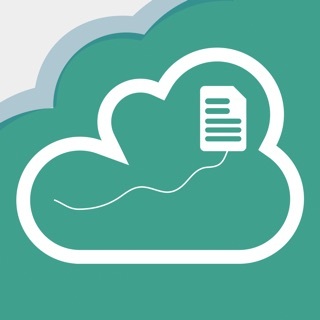 #1 Dropbox, Box, OneDrive, OneDrive for Business, FTP, SFTP, Amazon S3, WebDAV app in the App Store! #2 Productivity app in the App Store! 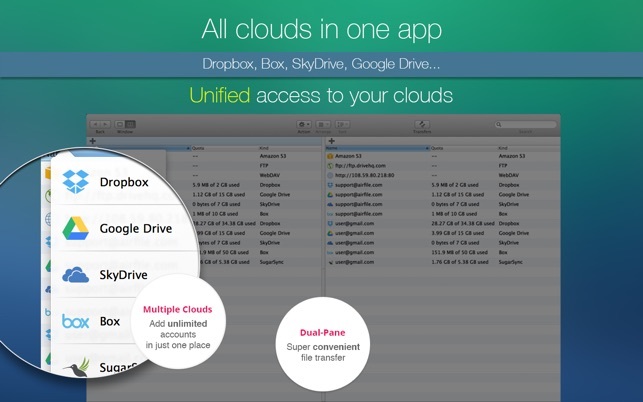 Are you looking for an app that allows for accessing multiple Dropbox, multiple Box, multiple GoogleDrive, multiple OneDrive, etc.? AirFile is exactly an app designed for this use case. 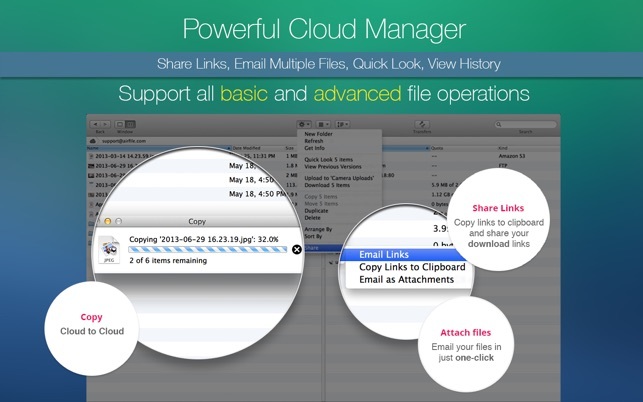 It allows you to add multiple clouds, email multiple files, upload any files to clouds, download photos and videos onto the device, sort files with many different options, transfer files between clouds, edit and save text files back to clouds, restore deleted files, and a lot more. 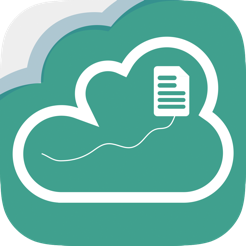 AirFile supports most of popular clouds: Dropbox, Box, GoogleDrive, OneDrive, OneDrive for Business, Bitcasa, Copy, SugarSync, ownCloud. It also supports many network servers: WebDAV, Amazon S3, DreamObjects, FTP, SFTP. ***** Rhoknee: "Elegant yet effective - It love this app. It is so well designed yet it does what it does so effectively. 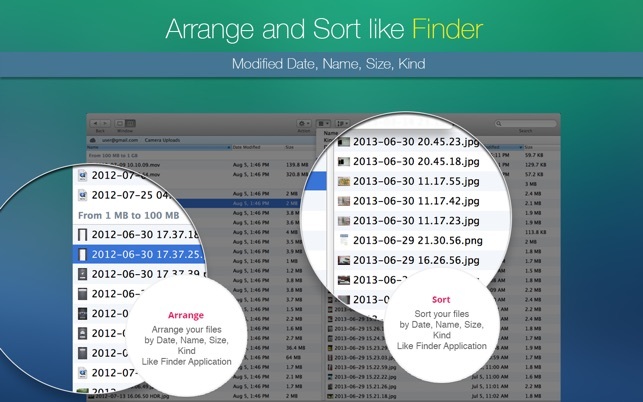 I can move files or even folders between my cloud spaces with so much ease. It has helped me organise my spaces." - Transferring files between two cloud accounts. 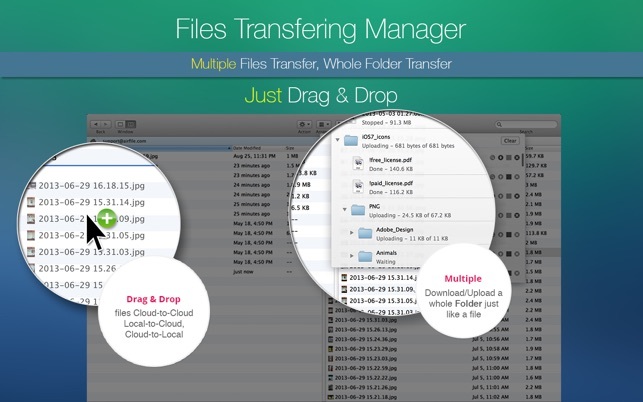 - Dual panes makes file transfer so simple. I wanted to move Files from Dropbox to Onedrive but can’t do this without adding my Dropbox Account. Does not connect to OneDrive for Business. That was the reason to buy it. Want my money. No test version available to test the app first. Fantastische App um alle meine Cloud Accounts zu verwalten. Das man Dateien zwischen den Accounts bewegen kann ist genial. Bei mir funktioniert alles fehlerfrei. Bin 100% zufrieden.